When it comes to resumes, there’s a piece of advice we’ve all heard loud and clear: make it results-driven. People say that recruiters and hiring managers don’t want to just see what you’ve done, they want to see results, metrics, and accomplishments. While this advice has some truth to it and is certainly well-intentioned, forcing numbers where they don’t fit seems clunky and let’s face it, not every job lends itself to numerical results and increasing sales by 8000%. So if you fall into that bucket where your results aren’t quantifiable, here’s how you can write really strong bullets without traditional results. This is my favorite way to take a weak bullet and make it compelling. If your resume currently says, “Set up for training sessions” you need to ask yourself why that task actually mattered. There is always an answer to, so what? You wouldn’t be asked to do something at work if it didn’t matter at all. Results aren’t just about percentages or dollars – they are about impact. Do you help manage projects from start to finish in order to keep them on time and under budget? Even if you can’t exactly say by how much you were under budget, it’s still powerful. Do you organize well-attended events that successfully bring brand awareness and promote new products? Some events closely track sales and output, but other companies don’t operate that way. That doesn’t mean your event wasn’t amazing. Metrics can be great on a resume even if they’re not showing an increase or a specific outcome. 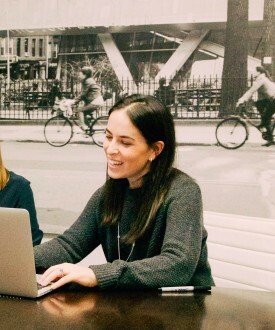 If I was still in a recruiting role, I might want to share on my resume that I am responsible for hiring 150 full-time employees and 100+ interns annually so people will understand that this is a pretty high volume and fast-paced role. If you’re managing social media accounts but haven’t seen explosive growth, you can still share that you have a combined following of X. When you get to the point where you have increased your following or decreased time-to-fill (recruiting term) by 30%, then of course it should go on the resume. In the meantime, using metrics to show detail and scope of the role will go a long way. Sharing details in general is a great way to make bullets compelling. Don’t just say that you monitor and update social channels — share exactly which ones they are. Don’t just say you work with clients to do X — share what industry they’re in or even who they are if that’s not confidential. You get the picture – adding supporting details will give a more thorough picture of exactly what you do. Use the job description to your advantage. Job postings are usually comprised of tasks, not desired results. If there are 10 tasks the company wants you to be doing in the job, make sure they can easily spot relevant items on your own resume. Now, I don’t advise going crazy and feeling like you need to spend hours customizing your resume to every job you apply for, but it’s certainly a best practice to take it into account up front. If you’re applying for roles that are similar in nature, this is an exercise you will probably only need to do once. Results and metrics are great (if you’ve got it, flaunt it!) 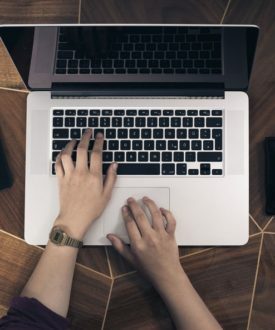 but on an initial first screen of a resume, the person on the other end is really looking to see if your experience is relevant and if you’re an expert in what you do. 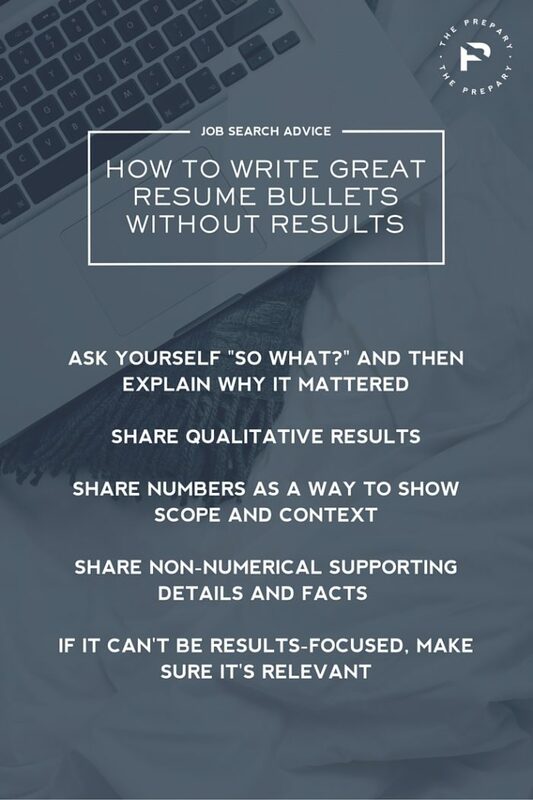 So don’t read this advice and feel that there’s only one right way to write resume bullets. In reality, there is a lot you can do on paper to show that you’re an amazing candidate for a job.